Flake has been a go-to breakfast spot for me for a while. It has indoor and outdoor seating, a chalkboard easel outside advertising specials of the day (I really get a kick out of chalkboards in restaurants for some reason), and the type of service where you order at a counter, take a number, and a server brings you your meal. Flake is not specifically vegan, but since a big part of its breakfast menu is a granola and cereal bar, I figured there would be a few options for me. In my pre-vegan life, my favorite item on the menu was the fruit kebab plate with cottage cheese. In fact, that was the only item I had ever ordered. I was glad that my new veganism was forcing me out of my menu rut, but I was nervous about asking the man at the counter for vegan menu advice. Part of me thinks this anxiety is silly: there are tons of vegans in Venice beach and people in the service industry are used to being asked about vegan menu options. But part of me also feels a combination of guilt (for being a picky orderer), embarrassment (I'm not sure why - maybe because I might be perceived as snobbish? ), and general self-consciousness in the few seconds leading up to ordering at a restaurant. I'll be interested to see if this twinge of anxiety dissipates over time. 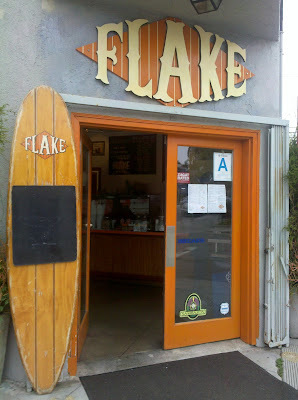 The man at the counter at Flake was extremely helpful, and not judgmental at all. He pointed out that soy, rice, or almond milk can be substituted for cow's milk in any of the make-your-own concoction menu items, so that whole section of the breakfast menu is vegan-friendly. You can also order any of their sandwiches in a "collard wrap" instead of on bread (I guess their bread options aren't vegan). I had never heard of a collard wrap, but he explained that it's just a huge leaf of collard greens wrapped around the sandwich ingredients, as if it were a tortilla. Fancy. It was pretty satisfying. The purple stuff is the acai mixture, which is cold and has the consistency of sorbet. 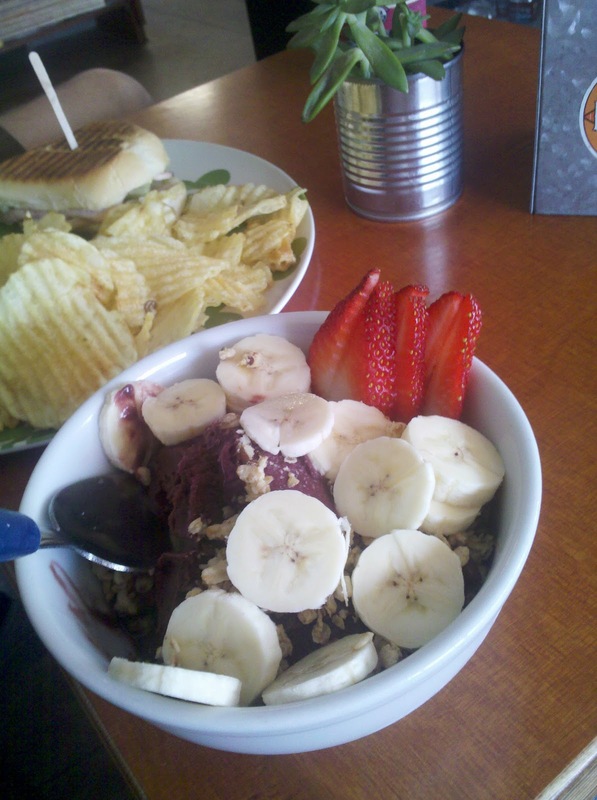 It's topped with Nature's Path Organic Hemp Plus Granola, strawberries, and bananas. The potato chips in the picture are on my boyfriend's plate - he got the "Cubano" sandwich and also really enjoyed it. Flake proved its awesomeness to me as a restaurant that I can go to with a non-vegan and we can both be satisfied.